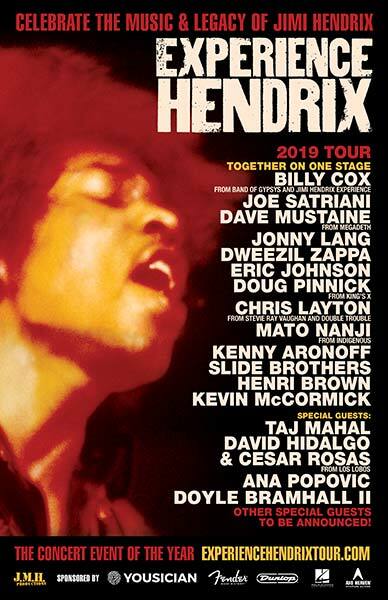 We would like to thank our sponsors for their gracious support and help in making the 2019 Experience Hendrix Tour a reality. Fender Musical Instruments Corporation (FMIC) is the world's leading guitar manufacturer, and its name has become synonymous with all things rock 'n' roll. It all began in a small town in northern Italy. Not just any small town, but a town rich in heritage — a heritage of innovation. A town known as the sports car capital of the world, and also known for its exquisite cuisine and as the birthplace of Balsamic Vinegar. And the birthplace of one of the most innovative companies in the music industry - the town of Modena, Italy. Seymour Duncan celebrates a rich history as the world’s leading pickup and pedal manufacturer. Since 1976, Seymour Duncan has helped the world’s artists develop their own unique, signature sounds. This is accomplished through a dedicated team of craftsman at their Santa Barbara, California office. We Love Guitars. It’s Our Passion! We wondered, “How can we capture the feeling and affection that is heartfelt into something tangible and uniquely personal?” This search has led us to create AXE HEAVEN. Through this journey, we’ve discovered there are multitudes of people who feel just as passionate about guitars and collectible replicas as we do. We’ve also discovered that there are even more people who love music and identify with the guitar heroes they listen to. And while many of those fans don’t even play an instrument, they would love to have something tangible in their possession to represent their love affair with music and their favorite artists. Hal Leonard Corporation is the world's largest educational music publisher, with the #1 methods for learning guitar (the Hal Leonard Guitar Method), piano (the Faber Piano Method), and school music instruments (Essential Elements for Band and Strings), plus publications for learning virtually every instrument imaginable. Strax Technologies Inc. and StraxArt™ is a forward-thinking technology and arts company presenting new genres of visual art and integrated live experiences; fulfilling our mission to create awareness, enhance the discovery of, and democratize the music and art experience like never before. J.M.H. Productions is a Seattle-based concert touring production company that manages Experience Hendrix Tour. Founded by James “Al” Hendrix, and owned and operated by the family of Jimi Hendrix, Experience Hendrix, L.L.C. and its wholly owned subsidiary Authentic Hendrix, LLC, exclusively oversee & manage the legendary artist’s internationally recognized copyrights, trademarks and servicemarks. Through their administration of his recordings, music, name, likeness, and image, the family continues to license and produce innovative products and services that closely mirror Jimi’s own unique creative vision.